From The Royal Engineers website comes this view of the Sapper’s camp circa 1860. The Fraserview condos now cover this area. 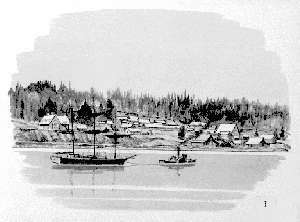 From The New Westminster Heritage website comes this view looking upriver about 1865, though the telephone poles would probably imply a later date. 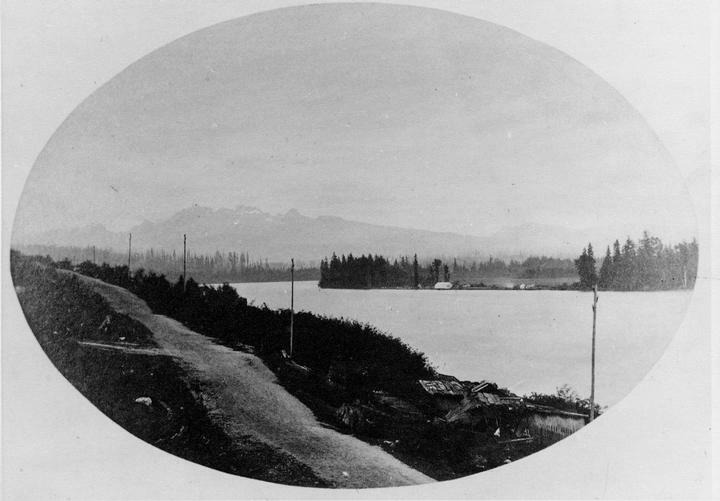 This shows the early road on its way from New Westminster to Sapperton. This picture would be taken about where the bridges now stand. 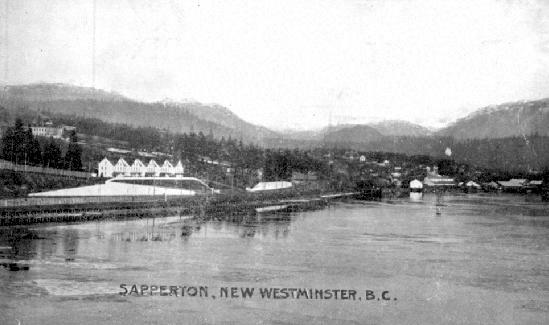 From The New Westminster Heritage website comes this sketch of Sapperton, no doubt based on the above photo. 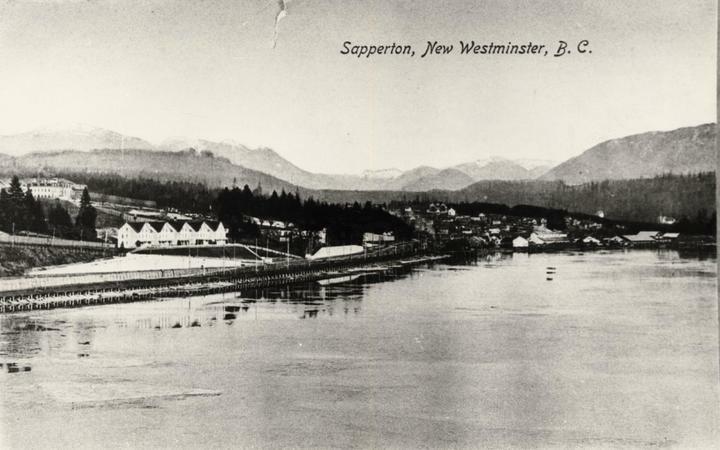 The first photo is from the BC Archives website and shows a view of Sapperton from the water, apparently taken in the 1870s. The second photo looks almost identical and is from The New Westminster Heritage website, which indicated it was taken in 1909 and provided the description below. Photographer: B.C. Photo Card Co. Description: This photograph is from an original postcard titled “Sapperton, New Westminster, B.C.” The line of white houses was on East Columbia and was known as Pen Row because it housed prison workers and their families. Building behind Pen Row and up the hill is the main building of the BC Penitentiary. Some of the buildings in Pen Row were apparently moved to Birch Bay in about 1973. 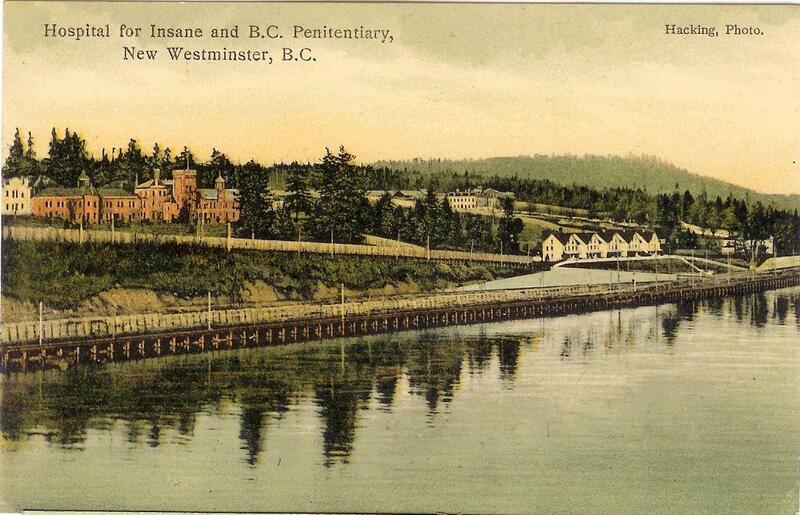 Here is a postcard similar to the ones above, but showing the Woodlands Hospital for the Insane on the left and the B.C. Penitentiary on the right. It was published by J. J. Mackay & Co., New Westminster, B.C. The scan was kindly provided by Rob McInnes of Santa Cruz, CA. From The New Westminster Heritage website comes this interesting old photo of a hotel in Sapperton from about 1865. Information: The Retreat was the first saloon and gathering place in Sapperton. Built a short distance from St. Mary the Virgin Anglican Church, this building served the local citizens and members of the military camped nearby. The picket fence seems to mark the boundary between the wilderness and ‘modern’ living. 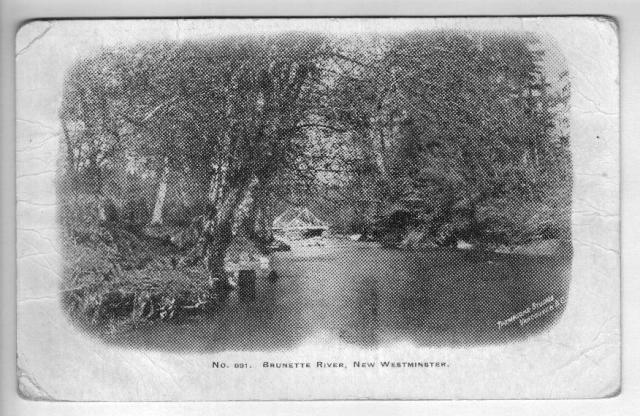 From The New Westminster Heritage website comes this view of Brunette Creek looking west. This is assumed to be the streetcar bridge crossing Brunette Creek where North Road still crosses. 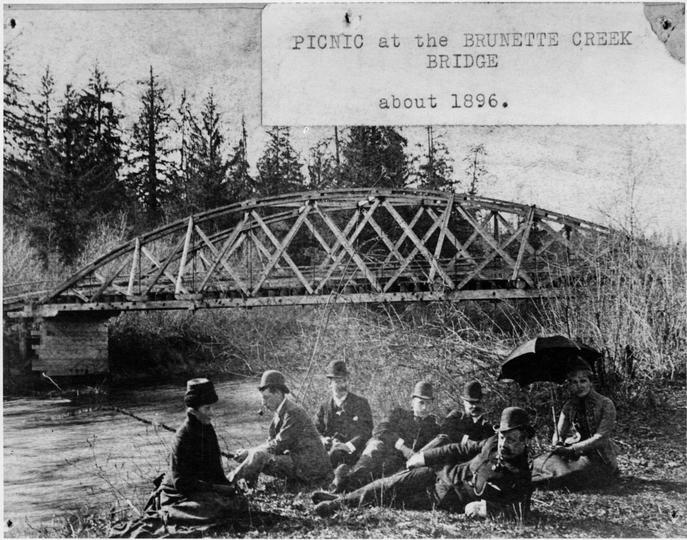 Description: Picnic at the Brunette Creek Bridge about 1896. Mrs. James Brymer, Mr. Fisher, Mr. Brymner, Mr. Lowry, Mrs. Brymner. From the collection of the author, come these views of Brunette Creek. The colour one was postmarked in 1911. Note the different shaped bridge in black and white postcard from the one from 1896 above. Note also the varying spelling of the Brunette/Brunnett River. Description: views of Brunette Creek. 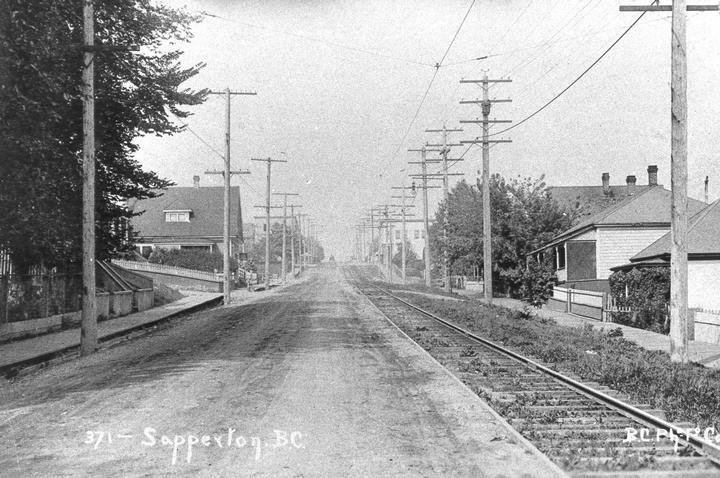 From The New Westminster Heritage website comes this interesting old 1914 photo of East Columbia Street in Sapperton, looking north towards Royal Coumbian Hospital. Information: Building at left, with sign, is the Royal Bank of Canada. 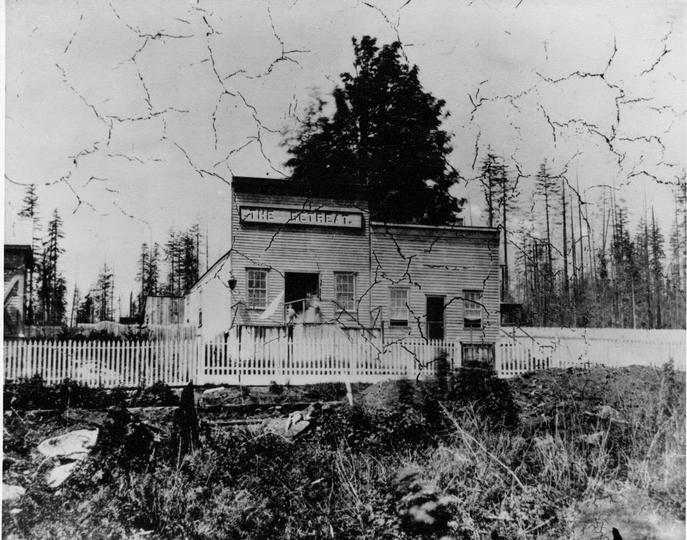 The Sapperton branch of the Royal Bank first appears in the 1913 B.C. Directory, by 1918 it is no longer listed in the directories. The bank was at 217 Columbia St. East – between Alberta St. and Keary. 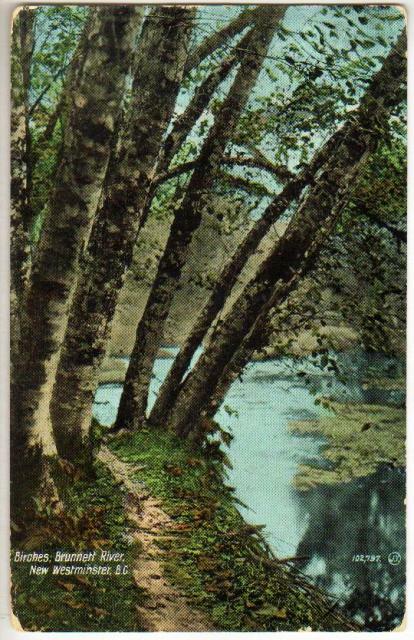 This print is from a postcard. The following picture is just about the same view taken in April 2003. Note the building at 217 East Columbia was still there between Alberta Street and Simpson Street in 2003, but was boarded up and had fallen into disrepair. In May 2004, a demolition permit was granted to remove this building and it was subsequently torn down. 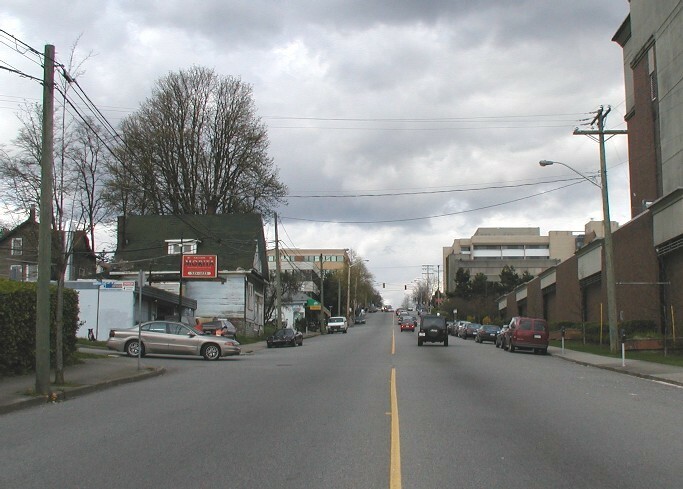 The houses on the right were removed for the Labatt Brewery complex shown in the 2003 photo. The Brewery District complex is on the site now (2014). The tall building in the distance on the right is the Royal Columbian Hospital. 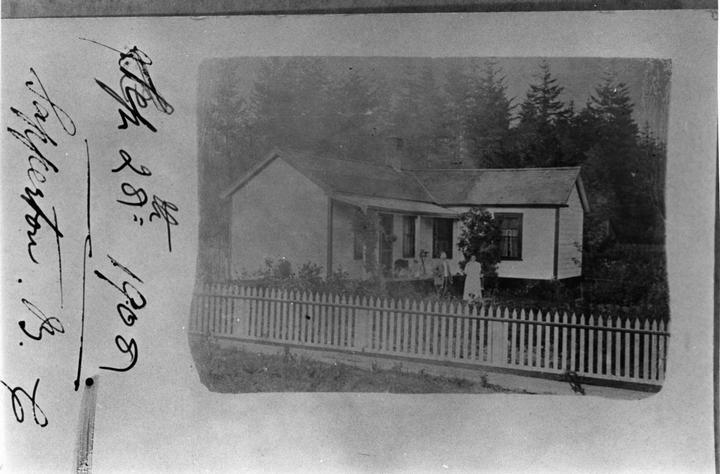 From The New Westminster Heritage website comes this photo of an unidentifed house in Sapperton, taken 28 Sep 1908. Information: Unidentified house in Sapperton. 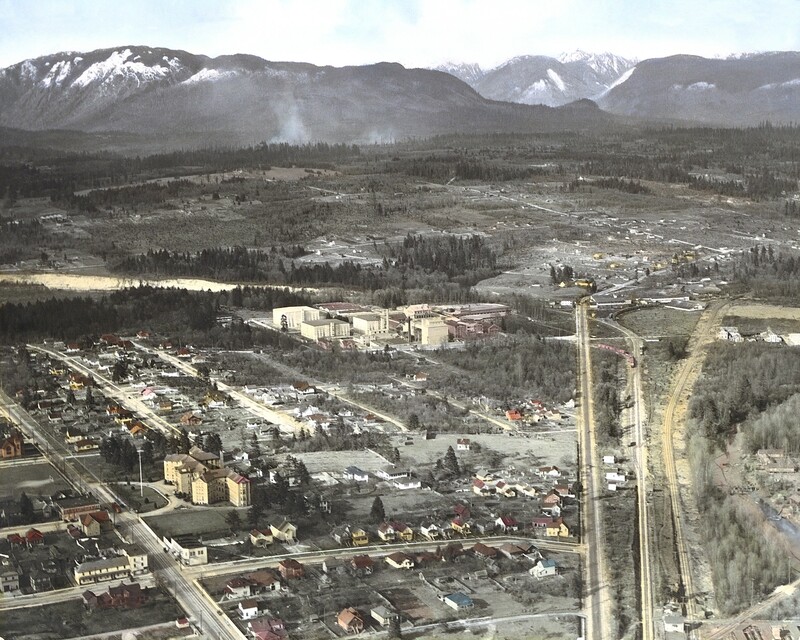 This is a wonderful old aerial view of the lower Sapperton area looking to the northeast with Coquitlam mostly bush. The picture is known to be taken in the mid 1920s, possibly as early at 1924 and taken to shoot the newly enlarged Distillery. The house at 401 Fader is shown and the building permit for that property shows it was built in 1927, though during renovations, a penny from 1912 was found. You should note the Royal Columbian Hospital in the lower left. In the center, you can see Seagram’s Distillery on Braid Street, which was torn down and rebuilt to be Woodwards warehousing and now stores bottled beer. A number of the houses below the Royal Columbian Hospital survived until early 2003 when they were torn down to build a lovely parking lot. Only one house survived and was moved. Click on photo to see an enlarged version. Information: Supplied to Geoff Pinkerton by Faye Olson. 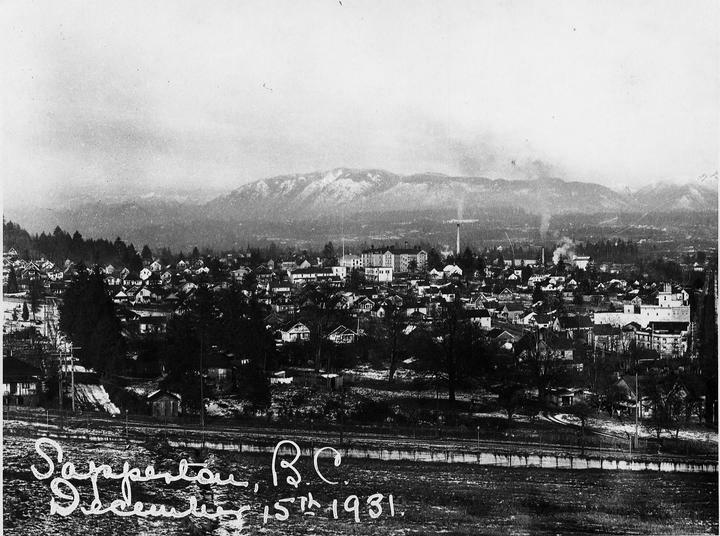 This photo from the BC Archives website shows a 1931 view from the walls of B.C. Penitentiary towards the mountains and Coquitlam in the northeast. The Royal Columbian Hospital is near the center of the photo. Description: View from the walls of B.C. Penitentiary across towards the Royal Columbian Hospital (centre). 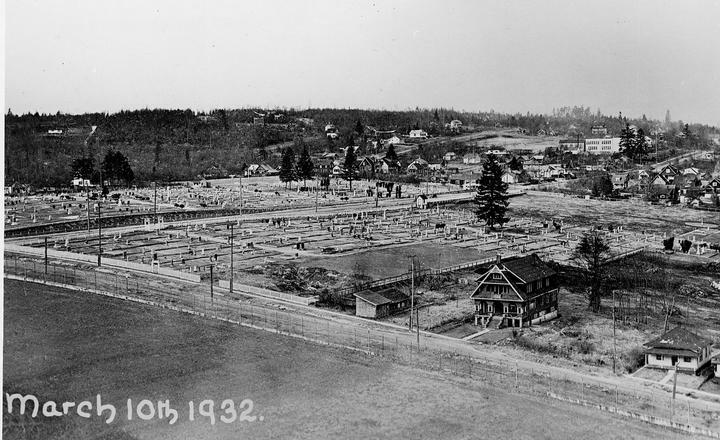 This photo from the The New Westminster Heritage website shows the Fraser Cemetery looking towards the northwest. Description: Probably taken from the walls of B.C. Penitentiary. Fraser cemetery in foreground. Cumberland Street running left-right, Richmond Street intersecting. The following picture was scanned from a BC Government Air Survey Photo with the title “Aerial view of the Fraser River looking upstream, to the east. 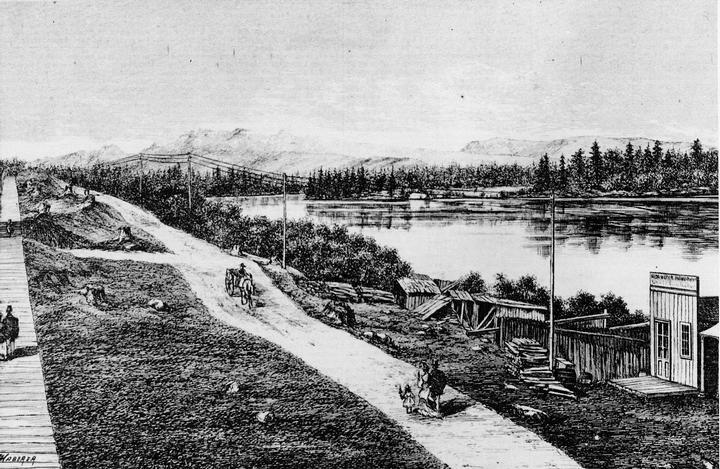 The Patullo Bridge in the right foreground, Fraser Mills and the District of Coquitlam in the left center of the photo”. The photo was taken on 4 Apr 1951 and the original is at Ray’s Barber Shop in Sapperton. 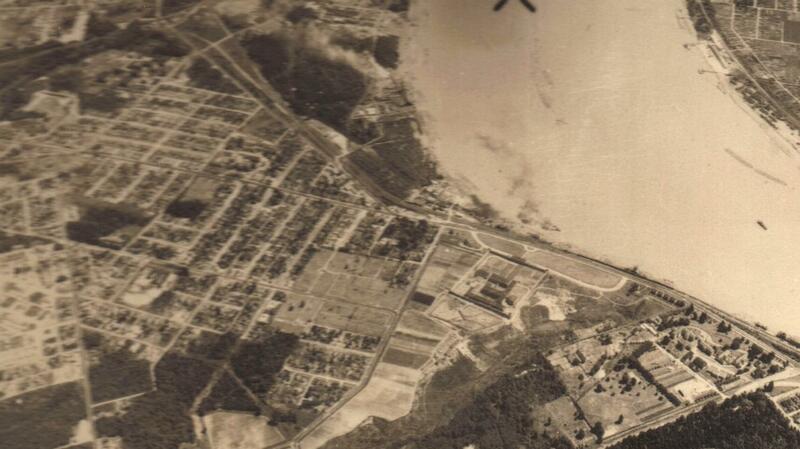 This detail from the original shows only the Sapperton area with the BC Penitentiary at the right. The cleared area to the left (north) of the BC Penitentiary is Fraser Cemetery.